Rusty & Pogo is the newest single panel cartoon series on the planet. With their sassy dog, Soup, these two stick figures get in more trouble than a new lab puppy. If you like abstract, wacky, weird, quirky, clever, historical references and everyday stuff that's fun, this is the place to set up base camp. 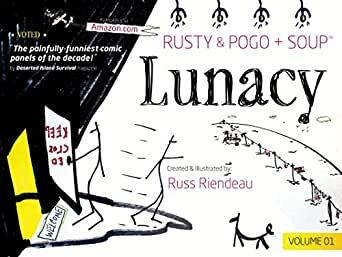 This is first of 3 volumes, titled Lunacy. Kindle Interactive Edition: This Print Replica book features interactive content which is only supported on Fire Tablets (3rd Generation and above) and Kindle apps for Android phones and tablets. Customers who download this book to other devices will receive a standard Print Replica book.